Northern Ireland manager Michael O’Neill is expecting a close match between two sides ‘in a similar situation’ when they meet Republic of Ireland in a high-profile friendly on Thursday night. 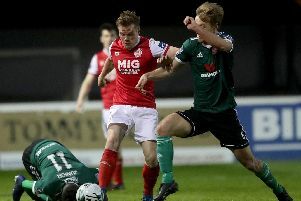 Both teams are in need of a win going into the match at the Aviva Stadium following frustration in the last 12 months. Northern Ireland have won just two of their last 11 games, while Martin O’Neill’s Republic side have endured a similar stretch with one win in nine. “Martin’s squad is in transition like ours,” Michael O’Neill said. “I think Shane Long not being available to them is a blow. But we’ll have to deal with players coming in with a real enthusiasm to play, players that want to prove themselves at international level. Much like our players as well. “With that comes a threat, the eagerness to do well, the eagerness to take the opportunity is something we have to match. “They are an incredibly hard working team, even in the results that have gone against them, it’s not been for a lack of endeavour and a lack of commitment or work rate. Northern Ireland’s main problems have come in front of goal, where they have created 46 chances in their three Nations League games but scored only one goal. “I’d be more concerned if we weren’t creating chances,” O’Neill said. “If we look back at Bosnia we hit post three times and then in Austria we had opportunities even at 1-0 down. “I’m not a big one about talking about luck or rub of the green, but I think in the last two campaigns - we won our group and finished second in the group - yet in these three games we’ve arguably created as many chances. The Republic won 5-0 the last time these two sides met back in 2011, but plenty has happened since then, not least Northern Ireland’s storming run to qualify for Euro 2016 and reach the Round of 16. One thing they have not tasted in that time is a friendly victory away from home - the last of those came against Finland all the way back in 2006. Those struggles in front of goal appear to have condemned Northern Ireland to relegation to the third tier in the Nations League format. Tonight’s match between Austria and Bosnia and Herzegovina in Vienna will determine whether Northern Ireland have anything to play for against Austria on Sunday. Attention has therefore turned to next year’s Euro qualifiers, with captain Steven Davis clear about the importance of building some momentum before the draw is made in December. “We want to go into those games with as much confidence and belief as possible,” the Southampton midfielder said. Michael and Martin O’Neill - the latter capped 64 times by Northern Ireland - may have gone out for dinner last night, but Davis expects there to be an ‘edge’ when the players meet on the pitch. “The players are very familiar with each other and it’s like playing any of the home nations, there’ll be that edge to the game,” he said.